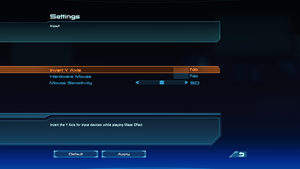 Use Mass Effect Mouse Fix to remove the game's mouse acceleration. SecuROM 7 and SecuROM PA DRM, three machine limit. A De-Authorization Tool is available. SafeDisc v4 DRM[Note 1]. Only in Hungary and Czech Republic. The provided keys are invalid to Origin, you need to contact Origin Support to verify them. StarForce 5 DRM. Only in Russia. Some keys provided by Steam can be activated on Origin, while others may have trouble activating. If your key fails to activate, you need to contact Origin Support. Origin version includes all DLC (existing Origin owners can install the latest update to get the DLC). Delete or rename BWLogo.bik, db_standard.bik and ME_EAsig_720p_v2_raw.bik. Delete or rename GLO_01_Relay.bik and UCW_Loading_Flyby.bik. The latest patch is update 1.02 which fixes various issues. The Steam and Origin versions are already patched. Vert-; use Flawless Widescreen to correct FOV and HUD issues. Set the game to run in windowed mode in the in-game video settings, make sure it's set to the same resolution as your desktop. Close the game. Make sure you haven't set the game to run in compatibility mode for XP nor Vista, the former causes borderless to be glitchy and the latter leads to a crash. Compatibility mode for 7 (if you're running 8+) is fine, should you need it. Delete or rename Splash.bmp, this prevents Borderless Gaming from making the splash window borderless, as this causes a crash for unknown reasons. Be aware that the MEUITM mod adds a new splash image, so be sure to re-delete/rename it again should you choose to install/reinstall it. Run the game and wait for it to get to the main menu. 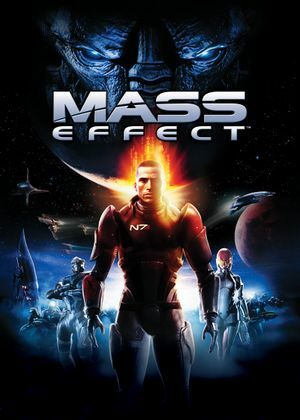 Run Borderless Gaming, click Mass Effect on the left panel, click the arrow pointing to the right. In a few moments the game window should become borderless fullscreen. If Borderless Gaming isn't making the game borderless try running Borderless Gaming as administrator. 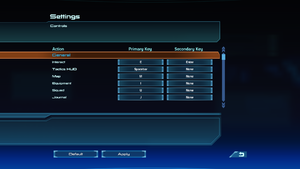 If UI elements are clipping off-screen, in Bordlerless Gaming, right click Mass Effect under Favorites, and check No Size Change. High quality AF is automatically enabled by ALOT. Search and change DepthOfField to FALSE. 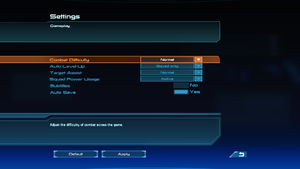 Use Mass Effect Mouse Fix to disable it. Installing this MOD will break some elements of the keyboard and mouse support. The console will work fine. If you want to play with keyboard and mouse, uninstall this mod. The ini substitutes are read only to prevent game from overwriting them. Unset this when adjusting options. To change sensitivity go to the configuration files location, open BIOInput.ini and adjust following values. Dialog, music and sound effects. By default, it can work only under XP. See No surround sound. Enabled by default, no way to disable. Retail only. Patch for this release here. Doesn't contain translation for Pinnacle Station. Unofficial patch which brings localization to digital release here. Retail only, DLCs not included. 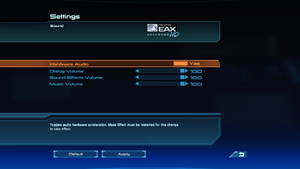 See Helix Mod: Mass Effect for better support. Playing in 4:3 resolutions like 1600x1200(useful for non-widescreen monitors and projectors) results in some menu screens displaying incorrectly: the left and right hand sides of the screen are clipped (as if "zoomed in" too far), so important information cannot be seen (like journal details and the map legend). Screens affected include: Map, Party Selection, Planet details, and Journal. Currently the only known fix is to use a 16:9 screen resolution when playing, like 1920x1080. Your squad, enemies, and objects that can be interacted with become boxy black blobs. This is a known problem on newer AMD processors - as the game uses the 3DNow! instruction set which was dropped in 2010 starting with the FX series of processors. To fix change the viewmode to unlit. First you will need to enable the developer console. 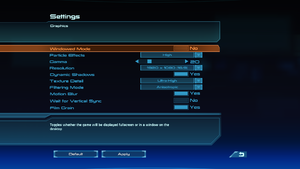 Boot up Mass Effect, open the developer console by hitting ~ and type in viewmode unlit. Should be good to go. It's possible these issues will only affect you in very specific areas, namely an area on Noveria and another on Ilos. After exiting these areas you can use viewmode lit to revert Mass Effect to its normal lighting. There's a possibility you will need to unequip then reequip armor to fix them after doing so. If the whole screen is black except for the UI, then Shepard fell through the Normandy and the save is bugged. Only happens on the Normandy, in the Engineering part of the ship. Never save there. Activate the console (instructions on how to enable the console further down) and type At BIOA_NOR00 Start_BIOA_NOR00_01 and press ↵ Enter. This will place you at the entrance to the Normandy and you will be able to save and load your game with no problems. If you fall through anywhere else in the game, pctweaks has a comprehensive list of all the "At string newArea" commands. This is also responsible for Steam Controller and Steam overlay not working. It's highly recommended to remove leftover registry values to avoid issues in other games. If when you get to Therum most of the ground is black, then you've got a common texture problem. Some of the black area is safe to drive on but some of it will kill you outright, making it quite hard to navigate. To restore the texture, go to %USERPROFILE%\Documents\BioWare\Mass Effect\Published\CookedPC. Restart and Therum should look fine. The game will take longer to boot on the first run after performing the above steps. This is due to the engine recaching all of the textures. Following the first boot, each subsequent boot up should be as normal. This issue is only found on Therum, so if the above steps do not solve the problem, you can continue to play as normal. IGameExplorer --> Verify Access. Unable to verify access to the game. If you receive this message, it may be fixed by running the .exe in compatibility mode for Windows XP Service Pack 2. Be sure to do this for the actual MassEffect.exe and not the launcher. The final folder tree will be \Mass Effect\Binaries\MassEffect.exe. The preceding folders will of course depend on how you installed the game (via Steam, via Origin etc.). To set the compatibility mode, right click the .exe, select properties. Go to the compatibility tab, select an option from the drop down list. The resolution listbox in graphics options does have up/down arrows on the right side, which are easily overlooked, that allow you to choose higher resolutions like 1920x1080. Improves stability on 64 bit systems with at least 3GB RAM by allowing the application to use more than 2GB RAM. Large Adress Aware doesn't work with the current version of Origin unless you run it as administrator. The game simply doesn't launch. To solve this issue exit Origin, right-click the Origin short cut, choose properties, enter the compatibility tab and tick "Run as administrator"
Similar high quality textures are automatically enabled by ALOT (ALOT sets the Min and Max LODSize to 4096). A compilation of textures not covered in MEUITM. Regularly updated, applies LAA, indirectsound, and texture bioengine.ini tweaks automatically for the user (very user friendly). MEUITM can be installed through ALOT. Install all non-texture based content/mods (such as the free DLC or the ME1 Controller Support mod) before ALOT. Regularly updated, applies LAA and texture bioengine.ini tweaks automatically for the user. Has mod options (picking different versions of textures) optional installs of ReShade, Indirectsound, and more (very user friendly). Can be installed through ALOT. Install all non-texture based content/mods (such as the free DLC or the ME1 Controller Support mod) before MEUITM. ↑ 2.0 2.1 File/folder structure within this directory reflects the path(s) listed for Windows and/or Steam game data (use Wine regedit to access Windows registry paths). Games with Steam Cloud support may store data in ~/.steam/steam/userdata/<user-id>/17460/ in addition to or instead of this directory. The app ID (17460) may differ in some cases. Treat backslashes as forward slashes. See the glossary page for details. ↑ The game is claimed to support up to 128 voices, so it must be using the fifth version.